Examining poverty trends in South Asian countries: where is Sri Lanka among its South Asian counterparts? South Asia has been accommodating a significantly large share of global income and multidimensional poor compared to other regions, but the Sri Lankan example can be learned from, writes N.R Ravindra Deyshappriya. South Asia has been accommodating a significantly large share of global income and multidimensional poor compared to other regions. The multidimensional poor refers to individuals who are deprived of more than one dimension such as health, education and living standards. During the last decade, the share of income poor in South Asia has increased, despite the share of multidimensionally poor showing only a marginal decline. Poverty reduction achievements in Sri Lanka have been remarkable during the last two decades and therefore Sri Lanka accounts for South Asia’s lowest poverty incidence in terms of both income and multidimensional poverty. The analysis based on international income poverty line of 1.90 USD (2011 PPP) per day and the Multidimensional Poverty Index (MPI) developed by Oxford Poverty & Human Development Initiative (OPHI). According to studies such as Bourguignon & Morrison (2002), the global poverty rate dramatically dropped from 94% (1820) to 10.7% (2013) during the last two centuries. However, South Asia’s share of global poor has increased from 27.3% to 33.4% during the period of 1990-2013, leaving behind only to Sub-Saharan Africa which accounts for the largest share (50.7%) of global poor. Despite South Asia’s share of global poor having increased, the number of poor people living in South Asia actually fell by 248.8 million during 1990-2013. 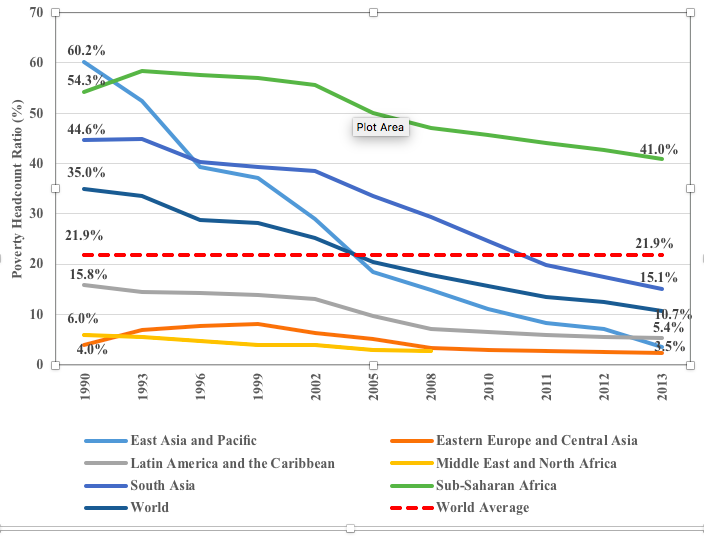 The figure 01 illustrates region-wise poverty reduction along with world’s average poverty headcount index during the period of 1990-2013. Specifically, the headcount index of Sub-Saharan Africa had dropped only by 13% during the period of 1990-2013 and remained at 41% by 2013. In fact, the headcount index of 41% (2013) is the highest amongst the regions and also higher than that of the world’s average headcount index (21.9%) during the period of 1990-2013. In contrast, the headcount indices of all other regions by 2013 were significantly below the world average and particularly, the East Asia and Pacific and South Asia regions performed remarkably well in poverty reduction during the period of 1990-2013. Particularly, the headcount indices of the East Asia and Pacific and South Asia regions dropped from 60.2% to 3.5% and from 44.6% to 15.1% respectively, during the period of 1990-2013. However, South Asia still accounts for the second highest headcount ratio and therefore the poverty rate in South Asian region is significantly higher than those of East Asia and Pacific, Eastern Europe and Central Asia and Middle East and North America by 2013. South Asia accommodated 33.4% of global income poor by 2013. Similarly, poverty headcount indices of South Asian countries are highly heterogeneous. 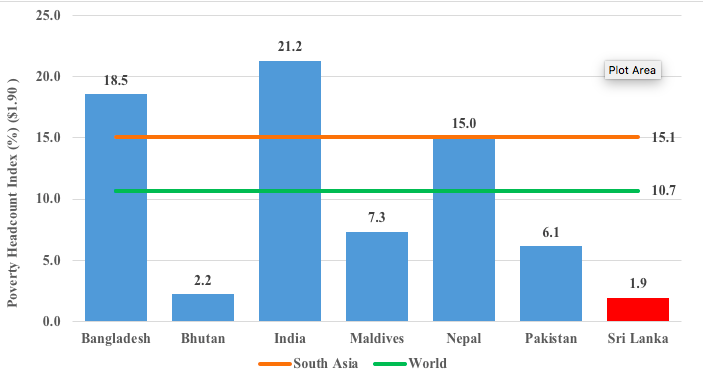 Figure 02 provides the latest available income poverty headcount indices of South Asian countries along with world’s and South Asia’s average headcount indices. According to the latest available data, 21.2% of the Indian population is living below the international poverty line of 1.90 US$. In fact, 270 million are considered poor, making India the poorest country in the region followed by Bangladesh where 18.5% of population is below the poverty line. The headcount indices of Nepal, Pakistan and Maldives are 15.0%, 6.1% and 7.3% respectively. In contrast, Sri Lanka has the lowest headcount index (1.9%) while Bhutan reported the second lowest (2.2%) in South Asian region. Source: Author based on the PavcalNet of World Bank. Notably, the headcount indices of poorer countries such as India, Bangladesh and Nepal are higher than that of the South Asia and global averages. In contrast, Sri Lanka’s headcount index which is the lowest in the region is considerably lower than both world and South Asian averages. The low poverty rate of Sri Lanka compared to other regional members is mainly driven by state providing free education and health services since gaining independence from British colonial rule in 1948. In addition, Sri Lanka’s social protection programs and other safety nets such as Janasaviya and Samurdhi have also been significant factors in lowering income poverty (World Bank, 2007). Table 01 indicates the reduction in poverty and growth rate of poverty reduction in South Asian countries. Nepal which has reduced poverty incidence from 81.0% to 7.26% during the period of 1984-2010 accounts for the highest poverty reduction (73.7%) and also the second highest growth rate of poverty reduction (91.0%). Similarly, Pakistan and Bhutan have recorded the second and third largest poverty reduction respectively, while Bhutan reported the highest growth rate of poverty reduction during the period 2003-2012. In fact, the headcount index of Bhutan has dropped from 35.22% to 2.20% within nine years: none of other South Asian countries has achieved similar poverty reduction in such a short period. According to Bhutan Poverty Assessment – 2014, there are three key drivers behind poverty reduction in Bhutan: increase in agriculture productivity and agriculture trade which is facilitated by trade agreements, expansion of road networks and other infrastructure facilities and spreading spillovers from hydroelectric projects. In contrast, both poverty reduction and growth rate of poverty reduction are lowest in Maldives where poverty reduction and its growth are equal to 2.6% and 2.67% respectively. The pace of poverty reduction of Sri Lanka has been modest, despite Sri Lanka’s poverty incidence being the lowest in the region. According to Table 01, the poverty reduction of Sri Lanka between 1985 and 2012 was only 11.4% while the growth rate of poverty reduction was 85.5%. In fact, Sri Lanka’s headcount index has been the lowest among South Asian countries throughout the history and therefore Sri Lanka accounts for relatively low absolute poverty reduction compared to other South Asian countries. In general, however, Sri Lanka’s poverty reduction has been slow due to several macro-level reasons. Sri Lanka’s growth performance fell well short of its potential in past decades and thus the process of growth-led poverty reduction has been inefficient. Low growth rate caused lack of job creation in the economy and rising income equality in Sri Lanka also reduces the pace at which growth translated into poverty reduction. Consequently, relative poverty reduction of Sri Lanka has been modest throughout its history. 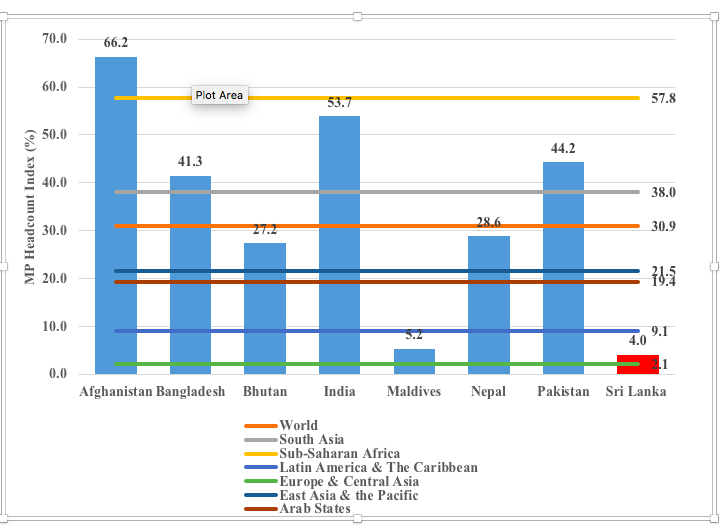 Figure 03 illustrates multidimensional poverty in South Asian countries along with regional averages. Afghanistan has a remarkably higher multidimensional poverty headcount index (66.2%), while 53.7% and 44.2% of the populations of India and Pakistan are respectively multidimensionally poor. Moreover, multidimensional poverty incidences of Afghanistan, India, Pakistan and Bangladesh are significantly higher than both world (30.9%) and South Asian (38.0%) averages. In-country disparities are also significant. For instance, the multidimensional poverty incidence in Afghanistan varies from 25% in Kabul to 95% in Urozgan (Alkire & Robles, 2017). Source: Author based on the data from OPHI. In contrast, Sri Lanka where only 4.0% of population are multidimensionally poor, has the lowest incidence of multidimensional poverty in the South Asian region. Furthermore, Sri Lanka’s headcount index is considerably lower than all the regional averages and global average as well. However, Sri Lanka’s headcount index is higher than Europe and Central Asia where only 2.1% of population are multidimensionally poor. In conclusion, it is obvious that South Asia accounts for the world’s second largest income poverty incidence, despite the fact that a large number of people have moved out of poverty during last two decades. Similarly, multidimensional poverty in South Asia is also considerably higher than that of world and other regional averages. Comparatively, both income and multidimensional poverty in Sri Lanka are considerably lower than not only that of other South Asian members, but other regional averages as well. In fact, safety net programs, state provided free education and health services along with other social protection programs are the leading factors of this low poverty incidence of Sri Lanka – something that the rest of South Asia must consider in its efforts to reduce poverty. Cover image: Two beggars on the streets in Udaipur. Neil Moralee, Flickr, CC BY-NC-ND 2.0. N.R Ravindra Deyshappriya is a PhD student at RMIT University, Australia and former Research Director at the Lakshman Kadirgamar Institute of International Relations and Strategic Studies (LKI). How you tried to correlate these percentage changes against the country population? For example, Bhutan is 800,000 people, Maldives 500,000 and SL is 24m……. whereas Bangladesh is 170m and India is 1.3b… And Bangladesh become a country in 1971…. Eve academically, does these comparison make any sense without those factors? ?